The 32nd annual Palm Beach International Boat Show kicked off yesterday for its four-day run. More than $1.2 billion in yachts and boating accessories will be on display during the show. Here is the list of top 9 yachts on display in Palm Beach, created in order of descending length. 70.2m Martha Ann was built for Warren E Halle and is the latest of three yachts commissioned by the American entrepreneur from Lurssen. Refitted in 2014, the yacht is classified by Lloyds and MCA compliant. Her 6 cabin-layout can accommodate 12 guests in a full beam master cabin, a VIP on the upper deck and four double cabins on the lower deck. From a technical standpoint, Martha Ann is powered by twin Caterpillar engines of 2,010 hp each giving her a maximum speed of 15.5 knots and a range of 6,000 nautical miles at 13 knots. For maximum comfort, this yacht for sale is fitted with zero speed stabilizers. Designed by the Codecasa team, Double Down features a high-quality stabilization system to ensure maximum stability while cruising or at anchor. Twelve guests are accommodated in 8 staterooms, including a master suite, five double staterooms and three twin cabins. The main deck’s salon is home to a grand piano, accented by rich mahogany and sumptuous furnishings. She accommodates 20 crew members. Her alluring features include a four-deck glass elevator, fully outfitted gym, movie theater, upper deck dining area with bi-fold sliding glass doors allowing 270-degree views, eight-person Jacuzzi, large sun beds and shaded lounging on aft bridge deck. Built in 2010 by Trinity Yachts and featuring an interior by Patrick Knowles, Skyfall is described as “urban contemporary with overtones of Zen.” Her all-aluminum exterior with a shallow draft allows for access to shallow waters that yachts of her size typically cannot reach. Her interior sleeps 17 guests in seven rooms, including a split-level master suite, VIP stateroom and five guest staterooms. In addition, she can carry up to 13 crew. Her alluring amenities include a spacious entertaining areas on all decks, touch-and-go-helipad, splash pool and spa tub on sundeck, split-level master suite with panoramic vistas, gym, basketball hoop, state-of-the-art stabilization system, 42” TV screens and en-suite bathrooms in all cabins, 30’ TBC tender and 18’ Novurania tender and tender garage, beach club. Madsummer, built by Feadship in 2005, features accommodation for 10 guests in five spacious staterooms, as well as a crew of 14. Her amenities include open deck areas, Jacuzzi, master suite with study and walk-in wardrobe, two waverunners, two kayaks, water skis and tows, swim platform, flat and plasma screen TVs. 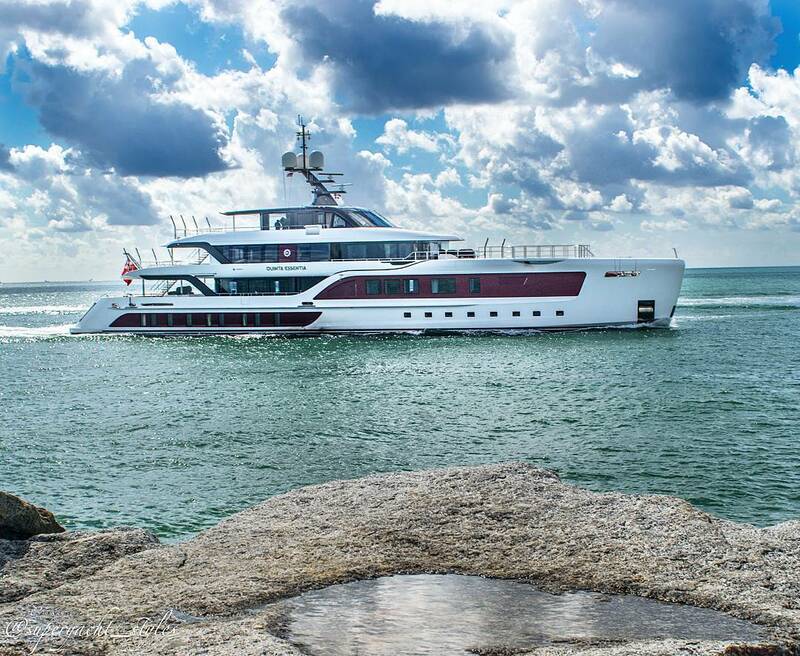 The all-aluminum Quinta Essentia can accommodate up to 12 guests over 6 generous staterooms, including a large owner’s suite on the main deck, a VIP cabin with a 180 degree panoramic view on the upper deck, and 4 cabins on the lower deck. The owner and guests will get to enjoy a pool on the main aft deck plus a spa below decks. The spa contains a hammam, a sauna and a massage area. Powered by twin MAN engines, she reaches a maximum speed of 16.5 knots, with an impressive range of over 6,500 nm at a speed of 9.5 knots. Huntress is a 54.86m luxury motor yacht built by Feadship in 1997. With a beam of 9.58 m , she has a steel hull and aluminium superstructure. She is powered by CAT engines of 1270 hp each and a cruising speed of 12 knots. 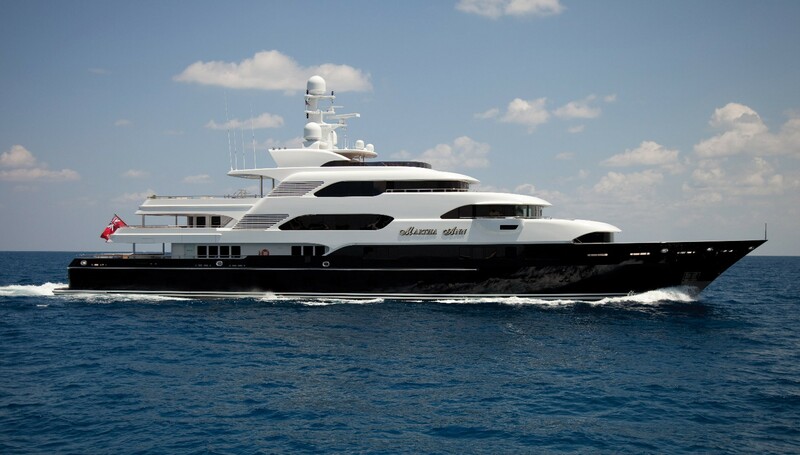 The motor yacht can accommodate 10 guests in 5 cabins and an exterior design by Terence Disdale. Spirit is a 54.3m motor yacht built by Amels in 2011. The yacht's interior was designed by Nuvolari & Lenard and her exterior styling is by Tim Heywood Design. With a beam of 9 m and a draft of 3.5 m, she has a steel hull and aluminium superstructure. She is powered by MTU engines of 2100 hp each and a cruising speed of 12 knots. The motor yacht can accommodate 11 guests in 5 cabins. Passion accommodates up to 12 guests in six cabins and 14 crew in separate quarters. The master stateroom and primary VIP stateroom have king-sized beds and en-suite bathrooms. On the lower deck, there are four additional rooms. Passion has a fully outfitted gym featuring a full bath and steam shower. Built by Feadship, Blu 470 is a vessel offering six staterooms with a completely new interior. She features refit with design by Adam Voorhees.